You’re our cup of tea. 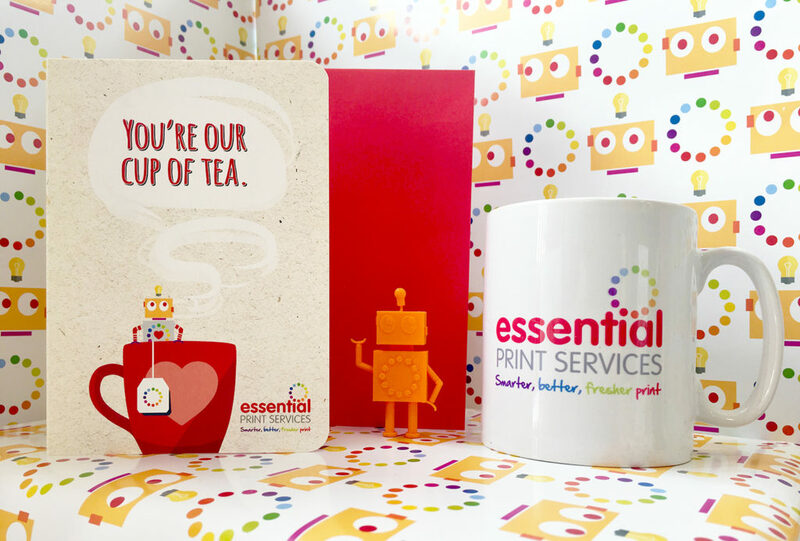 If you’ve reached this page, you must be a lucky recipient of an Essential Print Services’ Valentine’s card, sent with love from the Print Angels – we hope it was a pleasant surprise! OK, in all seriousness, we appreciate your orders and continued custom. As you may already know, we are so much more than just a print company. With your help and support, we continue to grow our business and therefore, create jobs, help charities and assist those brave souls who want to start their own companies. As one of our most valued contacts, we would like to offer you 10% off any orders placed and approved on Valentine’s Day 2019 – simply quote ‘fancy a brew?‘. Buying print shouldn’t feel like a blind date, so if you’re struggling to find the right words to say, or wonder what your new print might look like, fear not, we’re here to help! There’s nothing that we enjoy more than talking to people about their requirements, ideas and how we can help make it all happen! "Thank you for everything you have done and designed so far. I absolutely love the ‘look’ you have created for me and am very very grateful. The few people that have seen the business cards so far have made really great comments. I can’t stop thinking about new things for you to make for me!" 'We have been using Essential Print Services for a lot of our printed material now from beautiful business cards, various flyers & leaflets, corporate packs, menu booklets and price lists. Yvonne and the team offer a fantastic professional service with all of the products being expertly designed, finished to a high standard and delivered efficiently even when we have placed orders at the last minute! The attention to detail, and personal touches make Essential print services the only option for all our printing needs. We are always so excited to open the box and see the finished product as they look so great, and also the jelly beans are a fab touch too!!" Here is a company with the sort of energy, enthusiasm, positivity and creativity you don’t come across every day. EPS provides a level of care and knowledge about all things print, which is simply unavailable elsewhere. There is something very exciting about having your very own business cards! Thank you Essential Print Services, these are awesome! Friendly, efficient service, and super-fast delivery (oh, and my business cards look great!). Thank you to everyone at Essential. You have been the most enthusiastic among the other printing companies we asked. We have received the delivery. Thank you for your help with having these printed for us, they are exactly what we were after.